Black grouts bring out the intensity of tile colors while white grouts overwhelm them. 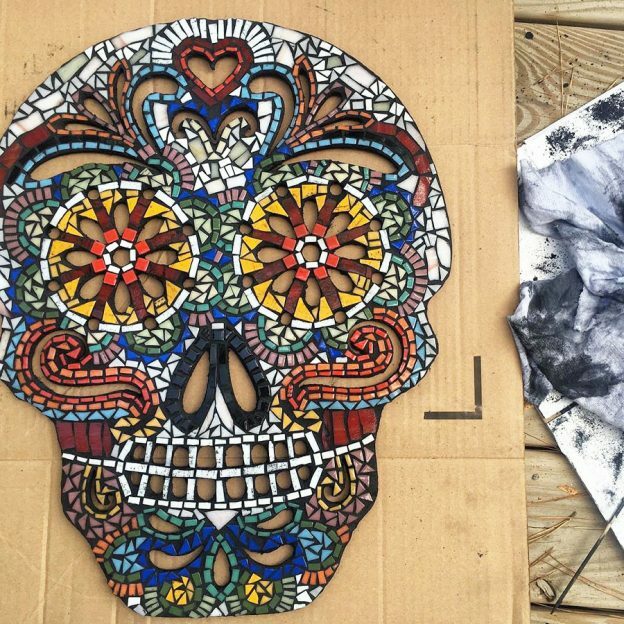 Natalie Knox’s Day of the Dead Skull mosaic is a good example of how well black grouts work and how a light colored backer isn’t a good indicator of the mosaic would look with white grout. When the gaps are filled with grout, they won’t have all the contrast provided by empty gaps, which have depth and shadow. A lot of white concrete at the same level as the surface of the glass tends to make the colors look washed out. 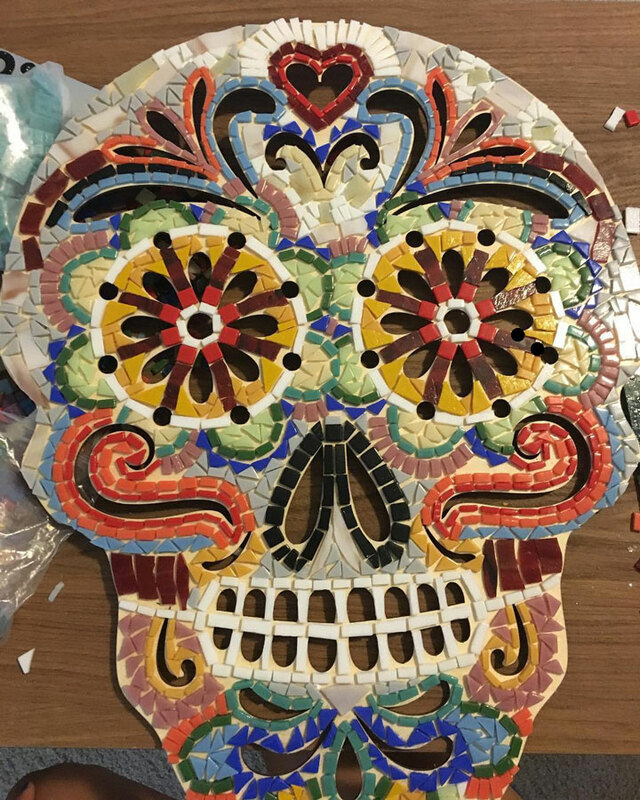 Day-of-the-Dead Mosaic by Natalie Knox in process before grouting. The photo above does NOT give an accurate impression of what the skull would look like grouted with white grout compared to black grout for several reasons. The empty gaps have a lot of depth and shadow because the light source is bright and to the side. There is additional contrast (compared to the photo of the black-grouted mosaic) because the dark background shows through the many slits in the mouth and eyes. The ungrouted mosaic was photographed in warmer light. Imagine it in cooler saturated light like the light in the photo of the grouted mosaic. The backer isn’t white. It is the warm hay color of unfinished plywood. If you are set on using white, use an off white, never pure white. Tip: Antique Whites and Light Beiges and Eggshells and Cremes and other similar light hues make better “whites” than pure white grout when used in mosaic images. Skulls are white, and so in this case a white grout makes sense in terms of what was being rendered. That still doesn’t change the fact that there will be a loss of contrast and the other issues explained above. This particular mosaic could get away with white grout because the grout gaps are relatively small. The smaller the grout gap, the less flash of bright white the overall image will have scattered throughout. If larger grout gaps are used, the mosaic image is dominated by lines of white concrete not the tile, and you find yourself wishing you had made the tiles larger. I think that would still be the case even if there is supposed to be skull or painted white face under the tile. Grouting changes the look of a mosaic, and many novices are disappointed because they used large grout gaps. To minimize the visual impact of grouting (and the choice of grout color), keep your grout gap minimal. If tiles only touch at points but not along the length of their sides, then tiles can be positioned very closely and yet still be grouted. Consider working in this way instead of carefully cutting each tile to maintain a uniform grout gap. This entry was posted in Art Review, Improving Your Art and tagged contemporary mosaic, grout on July 20, 2017 by Joe Moorman. Can you regrout over white grout? I am disappointed in my project using seaglass and wished I hadn’t grouted at all. They are very large mirrors so starting over isn’t an option. But would using black grout over the existing white grout work and give the richness of the seaglass color back? Also I used sanded grout which may have dulled the blue and green colors. Should I have used nonsanded? No, nonsanded grout is only used for hairline cracks (or mixing with sand). The sand didn’t dull the beach glass. That is grout residue. You can remove it by wiping with vinegar, but you have to wash it off quickly and thoroughly to avoid dissolving or bleaching the grout. You can’t regrout without scraping out the old grout. 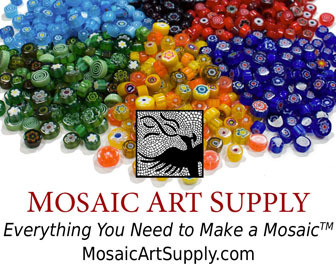 You can use artists acrylic paint to “stain” grout for dry indoor mosaics. The paint should stick to the porous grout but wipe cleanly off the glass. Thank you so much for your suggestions. Will give it a try! I have same problem too, I used dark grey grout the blue sky. But the grout made the sky colour look so dull. Is it use white grout better? Pure white ruins mosaics for the most part. Gray may have been a mistake, but white might have been a bigger mistake. Find a contrasting color, but avoid pure white. Perhaps and off-white. My mosaic is a woman’s face looking up at the night sky. What color grout is best for this? It depends on the colors used in the mosaic. The woman’s face has light pinks and the sky is dark blues. Should I use a dark grout or light grout?